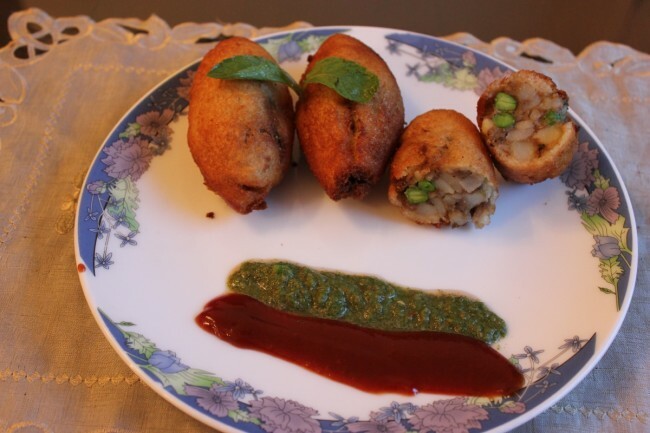 Dumplings stuffed with potato and peas and wrapped within soaked bread slices, stuffed bread rolls are delicious and an appetite filling snack. They can be served at breakfast or at tea time. Loved by people of all ages, the stuffing for these rolls can be varied as per choice. Veggies, chicken, cottage cheese or anything that you like can serve as a filling for them. Place a pan on flame and put 1 tablespoon oil in it. Add cumin seeds in it. When they start to crackle add coriander powder, salt, red chili powder, garam masala powder, dry mango powder and stir well. Add cut potatoes, green chilli, chopped coriander and boiled peas in it. Mix and roast for two minutes till all the spices get fused in potatoes. Turn off the heat and keep the mixture aside to cool. Put a frying pan on the heat with oil in it to get heated. Meanwhile dip a piece of bread in water and squeeze it with both hands to drain water. Put a tablespoon of potato filling on the bread and fold the bread to make it a roll. Fold properly from all sides so that the roll doesn’t open while deep frying. Make all bread rolls, deep fry the rolls in hot oil. Bring out from the pan and keep on the dish lined with paper towels to drain extra oil. Transfer in the serving dish and serve with green chutney and tomato ketchup.